As Remembrance Sunday is coming up this weekend, with particular poignancy, as it will mark a hundred years since the armistice, Brass seems the most appropriate piece of theatre to watch this week in the capital. 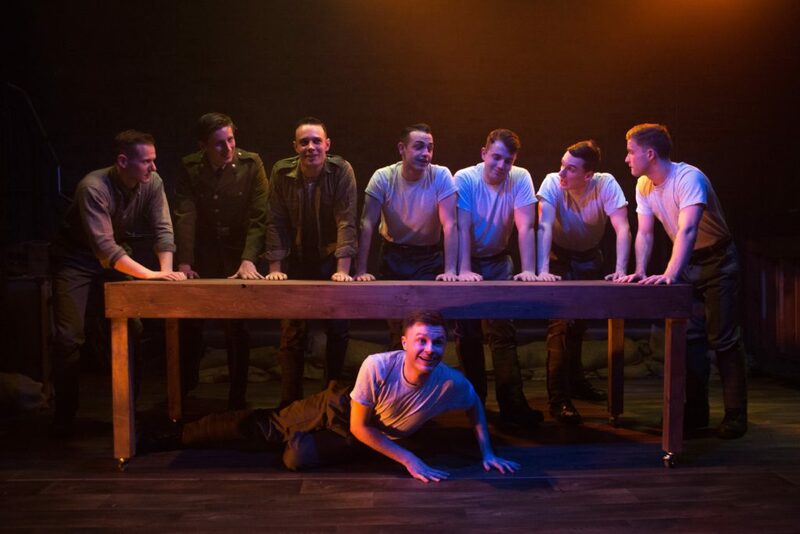 Originally commissioned by National Youth Music Theatre in 2014, Benjamin Till’s World War One musical now makes its professional premiere at the Union Theatre. Dramatising real life stories and people from the time, this moving piece about love and solidarity, humanises history and brings the forgotten to the foreground. The war has been raging on France’s frontlines for a year. Alf, conductor of one of Leeds amateur brass bands, has decided it’s time for him to enlist. With not much encouragement, the rest of the band also agree to sign up, no man wanting to be left behind. After some very basic training, they are packed off across the English Channel, with spirits high, ready to fight the Krauts and become heroes. It doesn’t take long before the true horrors of war reveal themselves. The cheery days in the band seeming like a distant memory. Back on home soil, the wives, girlfriends, and sisters of the men are left in Leeds to pick up the pieces, everyday, fearful of receiving the dreaded telegram reporting their loved one’s death. But these women aren’t sitting in wait; they bravely do their bit for the war effort, working at the Barnbow munitions factory. Through the correspondence sent between the men and women, the audience are transported back and forth between home and the ravaged front, proving the power of words in sharing love, encouragement, and reassurance. The most refreshing part of this production is having a story that evenly tells of both men and women’s trials and tribulations during The Great War. As incomprehensibly horrific as being in the trenches must have been, seeing your friends killed right before your eyes, it is just as hard-hitting hearing about those treacherous times through the female perspective. With sensitive sophistication, Brass is a multi-faceted exploration of the devastation war brings to every member of the family. Benjamin Till’s music ranges from haunting lamentations to raucous morale-boosting ditties, which help to bring light and shade into the show. Most songs are rather unmemorable, yet still excel at moving the story onward, offering the emotional clout needed. The power of the cast’s voices is exemplary, creating gorgeous harmonies that can be spine tingling. With just the Musical Director, Henry Brennan, on the piano, this basic set up gives space for the singing to take centre stage. Highly moving and heartfelt, Brass compels you to reflect, and make sure that the lives lost to the war are not forgotten.